in no way intimidated with his opponent’s hometown advantage. 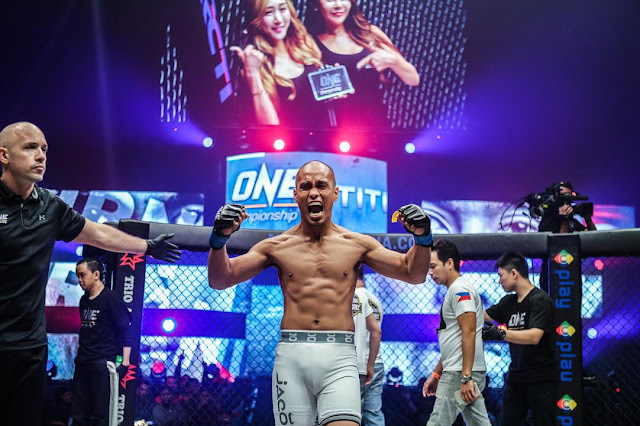 Soriano is set to return inside the ONE Championship cage against Malaysian standout Saiful Merican in a three-round bantamweight contest on the undercard of ONE: THRONE OF TIGERS, which takes place at the 12,000-seater Stadium Negara in Kuala Lumpur, Malaysia on 10 February. The 30-year-old native of Narvacan, Ilocos Sur had his first overseas match this past August, scoring a lightning quick 15-second spinning backfist knockout of Mario Sitya Wirawan in his opponent’s hometown of Jakarta, Indonesia. Given that the three-round marquee match-up will be held in Malaysia, Soriano feels comfortable competing on foreign soil. “I always want to fight abroad. I want the feeling of entering hostile territory because it brings out out the best of me,” he said. “I am so motivated for this fight because I am facing a hometown hero in Saiful Merican. You all know what happened in my last fight,” Soriano added. Against a fellow striker like Merican, Soriano revealed that he is taking a smarter approach in his training camp. “We’re doing a lot of striking since my next opponent is a well-versed striker. I’m also having an intense strength and conditioning program, so on fight night, I will have the best cardio. We have to prepare smart for him because I know he also wants to win,” he stated. Merican, who holds a professional mixed martial arts record of 4-3, is coming off a first-round knockout setback to Team Lakay’s Geje Eustaquio in January 2016. Soriano expects that Saiful will squeeze himself through the eye of a needle just to get the win in his comeback bout. “I know the feeling that you’re so eager to bounce back. I can sense that he is hungry to get that win. But I promise that it won’t be easy against me. I also want to win and establish myself as one of the best fighters in ONE Championship,” he declared. Soriano promises that his upcoming meeting will be the most exciting fight on the card, but he issued a stern warning to Merican as he will get his whole country’s support on fight night. “I am a fighter who always looks for a strong finish. We’re both strikers, so expect some fireworks. Even though Saiful has his whole country behind him, I am coming to Malaysia to win. I am ready wherever the fight goes,” he stressed.